S-Adenosyl-L-methionine (SAMe) or ademethionine is a natural occurring molecule that is formed in the body from methionine, an essential amino acid. Up to half of the daily intake of methionine is metabolized into S-Adenosyl-l-methionine in the liver. SAMe plays an important role as a methyl donor in more than 100 methyltransferase reactions. S-Adenosyl-l-methionine Disulfate p- toluenesulfonate is the stable form of the methionine. In Transmethylation reactions, SAMe donates a methyl group to a wide variety of substrates including DNA, proteins, neurotransmitters and phospholipids. In Transsulfuration reactions, SAMe is converted to cysteine; precursor of glutathione, major cellular antioxidant. SAMe also stimulate synthesis of the proteoglycans used for cartilage regeneration. In Polyamine Synthesis/Aminopropylation, SAMe is involved in synthesis of the polyamines spermidine and spermine through the aminopropylation pathway. Spermidine and spermine have anti-inflammatory and analgesic effects. Polyamines are involved in regulation of cell growth. 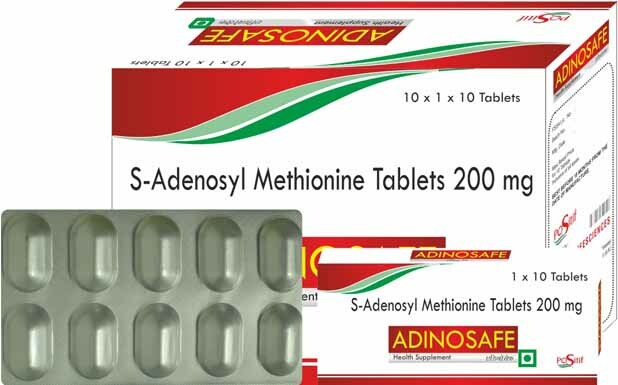 S-Adenosyl-l-methionine is a physiological precursor of thiols and sulfurated compounds, which are known to be decreased in patients with liver disease. SAMe therapy exerts an important role in reversing hepatic glutathione depletion in patients with liver disease. S-Adenosyl-l-methionine exerts many key functions in the liver, including serving as precursor for cysteine, one of the amino acids of glutathione; the major physiologic defense mechanism against oxidative stress. S-Adenosyl-L-methionine is major methyl donor in the brain that is involved in the pathways for synthesis of hormones, neurotransmitters, nucleic acid, protein & phospholipids.According to biogenic amine hypothesis, depression is caused by the deficiency of monoamines, particularly norepinephrine and serotonin. SAMe is required for the synthesis of norepinephrine, dopamine & serotonin. SAMe exerts analgesic activity and stimulates the synthesis of proteoglycans by articular chondrocytes with minimal or absent side effects on the gastrointestinal tract and other organs. The intensity of the activity of SAMe against osteoarthritis is similar to that exerted by non steroidal anti-inflammatory drugs, but its tolerability is higher. SAMe is naturally occurring molecule in the body. It functions as methyl donor in more than 100 methyltransferase reactions. Also involve in synthesis of the polyamine that involved in regulation of cell growth. SAMe is major methyl donor in the brain that is involved in the pathways for synthesis of hormones, neurotransmitters, nucleic acid, protein & phospholipids. SAMe is required for the synthesis of norepinephrine, dopamine & serotonin. After oral intake, SAMe is absorbed from the small intestine. It is better absorbed if taken empty stomach. Systemic bioavailability of SAME after oral administration is low. It is metabolized in liver. It crosses blood brain barrier and slowly accumulate in cerebrospinal fluid. Serotonin syndrome: Risk of serotonin syndrome can be there if SAMe is taken concomitantly with any of the following drugs: dextromethorphan (present in some cough formulations), pethidine, pentazocine, and tramadol. Antidepressant medications:-SAMe may interact with antidepressant medications, increasing the potential for side effects including headache, irregular or acceterated heart rate, anxiety, and restlessness. Caution and medial supervision is advised for concomitant use. Levodopa: SAMe may reduce its side effects and also its effectiveness over a period of time. Medications for diabetes:SAMe may reduce levels of blood sugar and may strengthen the effect of diabetes medications, which increases the possibility of hypoglycaemia.